Drilling has highlighted mineralization along other structures outside of the historical resource area and decreased the 'gap' between the Porter and Silverado mines, showing potential for continuity under the peak of Mount Rainey. The Blind Vein lies between the D- and Prosperity Veins and had a total of seven drill holes targeted along sections in 2018. Each of these holes demonstrated mineralization, with only one (PIP18-015) having grades under 30 grams per tonne silver (and therefore reporting as 'no significant intervals'). The Blind Vein was historically mined but was one of the last to be developed on the site, and so was not as exploited as the other two major veins on site. Perhaps the most interesting concept currently is that the main D-Vein is part of a synclinal 'bowl shape' fold that encapsulates the Blind and Prosperity Veins. This structure would account for the historical veins encountered in the "H" and "I" Tunnels, and the newly discovered 'Flat Vein / Honest John Vein" to the west of the historic Porter system. It also places the more disseminated Wake and Angelo veins on the outside of this structure and could explain the variation we see in structure and mineralogy. 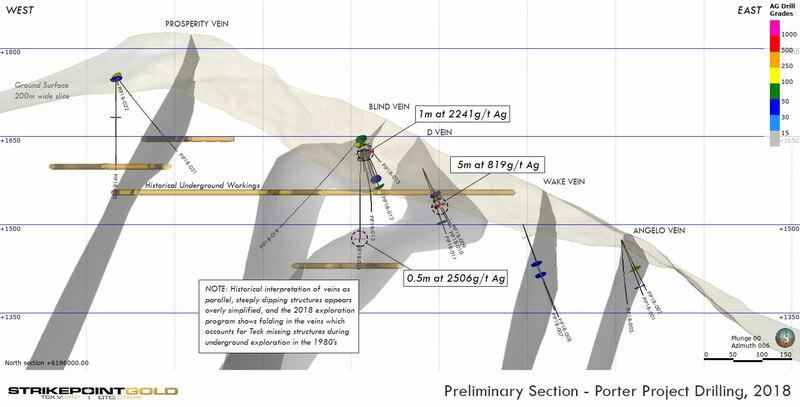 The concept of mineralized 'bowl shaped' features is not unprecedented in the area, with the nearby Premier Mine (Ascot Resources) having a similar shaped structure hosting their main high-grade (gold) targets.